The in-counter scanner Magellan 9300i/9400i from Datalogic captivates with its proven housing conception and powerful 2D imager technology. As a result it quickly and reliably scans the product from all planes, ensuring for high throughput at the checkout. Its shape will remind you of a traditional in-counter scanner, with its horizontal and vertical window. 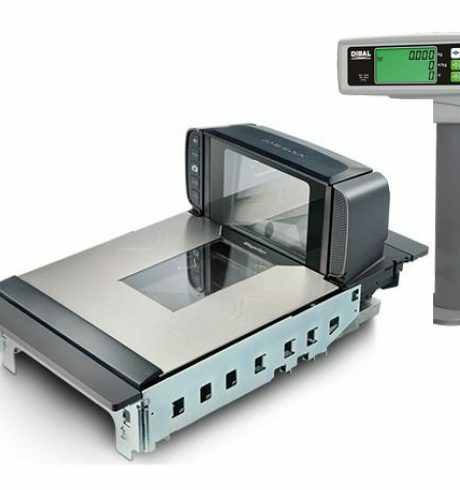 It comes in three various length variations, offering compatibility with existing POS areas and scanning technologies, and at an attractive price-performance ratio. Datalogic is so confident about the extreme robustness of its unique, integrated Clear Glass that they give the first owner a lifetime warranty on it. Customer loyalty has also been taken into consideration: with the optional »Customer Service Scanner (CSS)« you easily engage customers with the scanning process, and parallel allow them to scan rebate codes from paper coupons, and even from smartphone displays. This supports e-commerce campaigns and significantly reduces overall processing time. Numerous maintenance possibilities and functions come standard with Datalogic’s in-counter scanners – with Wavelink Avalanche, JavaPOS, OPOS and many additional management solutions you always have practical access to statistics, scanner information and status reports via remote maintenance.